Emily Ruskowski is a Boston-based stand up comedian. She has performed across the country and participated in several comedy festivals. In 2015, she was named of one the Comedy Studio’s Comics in Residence and opened for Maria Bamford a the Wilbur. The Boston Globe said: “She has the charm and affability of Brian Regan and a casual sense of storytelling like Janeane Garofalo.” Emily has been featured in the Boston Globe and the Washington Post. She has performed on Laughs TV on the Fox Network and the popular “Two Dope Queens” podcast. Jody Sloane cut her entertainment teeth doing her sit-down shtick as a cheeky “Conducktor” name Penny Wise on the Boston Duck Tours. Her duck tour experience — 4,000+ tours — was the perfect tee-up to becoming a stand-up comedian. 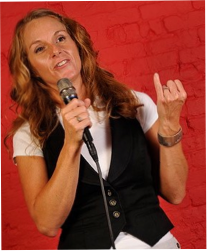 She’s now a regular at esteemed comedy venues, including Headliners Comedy Clubs throughout New England, Gotham Comedy Club in New York City, Comix Comedy Club at Foxwoods, plus roadhouses, Elks Clubs and dives from Portland to New York. Wherever people need to laugh, Jody answers the call and is a favorite for booking agents and clubs across the Northeast. Kristin O’Brien one of the rising stars on the comedy scene. 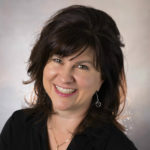 “Auntie Kristin” will make you laugh non-stop when you hear her views on marriage, divorce and dating. 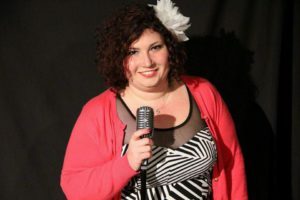 She has performed at clubs and colleges all over the country and appeared at the She Devil Comedy Festival in New York. 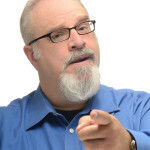 Jean’s house comic and comedy event producer, Greg Boggis was recently awarded honorable mention in the comedian category by Hippo Magazine and his monthly comedy showcase at Fody’s Tavern in Nashua was named one of the top 5 comedy venues in NH by the website Best in NH. NH favorite from The Strange Name Movie!